After an enduring winter, it finally seems like spring-time warmth is coming to us. 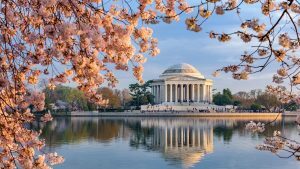 The iconic DC Cherry blossoms are expected to be in peak bloom this weekend and we wanted to give a quick guide to catch the best views of these marvelous beauties. 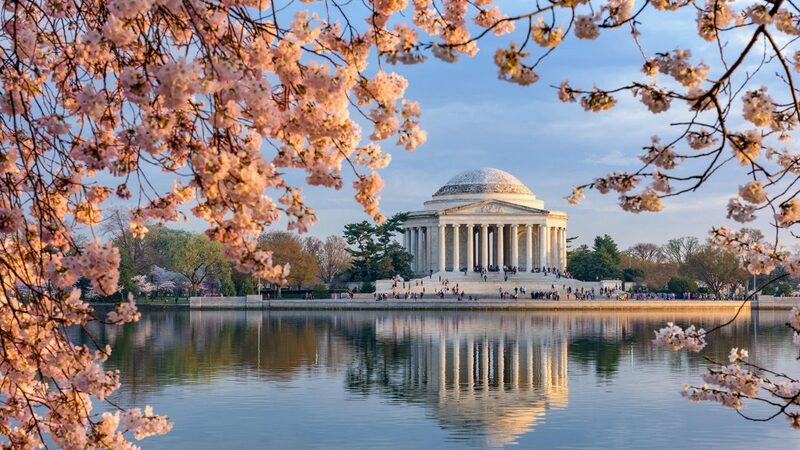 With the Cherry Blossoms being a major draw for tourists around the world, getting the best spot can be a real challenge, especially if you’re coming off of work. Rest assured knowing with these five spots you’re guaranteed to get a view that’ll be worth the wait. Yes this one is the most obvious, but often is the most populated spot for people to congregate for the Cherry Blossoms. Due to the high volume of traffic usually in this area, sometimes it’s tempting to avoid the tidal basin. However, with the reflection of the Potomac and the Jefferson Memorial in the background, this location is bound to give you the best pictures of all the colors of the scene. Because this is primarily where the Cherry Blossoms are, it’s hard to go wrong! If you’re not much a fan of navigating mobs of people, another great spot is across the tidal basin at the Jefferson Memorial. Watching them from here gives you a great angle as the sun sets to see all the blossoms in the horizon. With less people here in general, it’s a peaceful place to bring you and your loved one or a relaxing stretch of quiet. 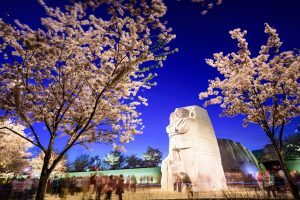 Kept away from the traffic of the tidal basin, the Martin Luther King memorial is another awesome place to enjoy the cherry blossoms. With the perimeter of the monument being surrounded in cherry blossoms, you can’t help but feel like you’re part of nature. 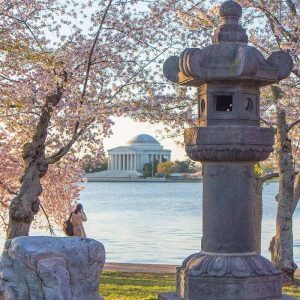 Every year the Japanese Stone Lantern is lit to mark the start of the National Cherry Blossom Festival as a representation for the embassy of Japan. 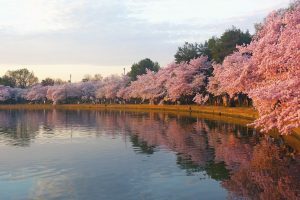 Positioned along the tidal basin of the Potomac, catching the cherry blossoms from here can’t disappoint. You’ve got access to the waterscape, a foreground of beautiful blossoms and a ceremony only celebrated once a year. 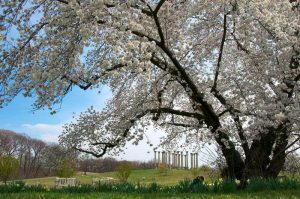 If you’re looking to really get away from the madness of tourist season, check out the National Arboretum. This time of year the sights are absolutely stunning. Not only are the cherry blossoms in bloom, but you also get to see everything the arboretum has to offer. Regardless, this time of year it’s hard to go wrong. Spring is gorgeous; give yourself the chance to appreciate what it has to offer. It’s a time of new beginnings, new awakenings and maybe even new opportunities! Maybe you’ll be inspired to go on that run you’ve been meaning to take, or apply to the new opening at that job you always wanted. All of nature is soft resetting so why can’t you?